Wednesday, 30 January 2019, 12:10p.m. A Hawke's Bay family is grieving after the death of a second son but say they have "no anger or resentment" toward the driver of the fatal crash. 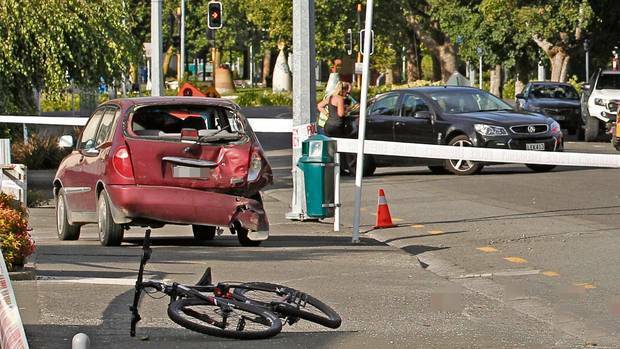 Thirteen-year-old Joshua Mou passed away at Hawke's Bay Hospital yesterday morning after his bike collided with a van on Monday. The teenager had biked to school to buy stationery and socks, the day before he would have attended his first day at Hastings Boys' High School. His parents, Anton and Leona Mou, spoke with the Herald and said Josh was a son, brother, uncle and cousin to many and would be missed "so much". He celebrated his 13th birthday earlier this month, and was remembered as a "happy, fun-loving kid", with an "infectious smile". Josh's death comes as a devastating blow for the family, who also laid to rest Anton's mother in November after she died of cancer while Anton's oldest son Levi also died in a car crash in April 2011. "This was like a deja vu experience," Anton said. "We were at ICU and coincidentally had the same specialist that looked after Levi also look after Josh." Anton said the last conversation he had with Josh was before he went to Hastings Boys' to pick up stationery. "I was going to take him but he decided to bike. Our last conversation was 'I'm gonna bike to the school, wanna catchup with some mates, pay for my school stuff, then come back home' - that was around 2ish. "The next time I saw Josh was when he was in ED with doctors doing CPR on him." Enquiries are ongoing regarding the circumstances of the crash. Despite the devastating circumstances, the family said they would like the driver of the vehicle to know they hold no anger or resentment. "It was a tragic accident and we hope they take the time to heal so they can move forward in their life," Anton said. Leona Mou said Josh would be remembered as a happy, fun-loving kid. "He was cheeky, quick witted and even a little arrogant - always bragging about how he was the best at everything," she said. "He was very thoughtful and caring. A great helper and hard worker - no job was too big, just get it done. "His laugh and that smile were infectious and we will miss him so much." Josh attended Raureka Primary School, Hastings Intermediate and would have started his first day of high school at Hastings Boys' on Tuesday. Yesterday, Hastings Boys' principal Rob Sturch said Josh had purchased his uniform and done everything to prepare for the year. "By all accounts he was a bright, friendly boy. It's a real shame we never got to know him a bit better," he said. Josh was an active participant in all school activities at Raureka and was in sports academy, kapa haka and choir at Hastings Intermediate. Hastings Intermediate principal Perry Rush described him as a great kid with a sparkling and engaging personality. He said Josh was a bit cheeky, and a valued member of kapa haka and the rugby team. Leona Mou said her son also really enjoyed the outdoors. "He thought gumboots were an everyday shoe," she said. He climbed "The Needle" mountain in Rarotonga, and loved fishing at Waimarama, exploring Bare Island and hunting rabbits, goat and deer. "Bike riding down to the river on a hot summer's day or up Te Mata Peak with his mates had become his new passions," Leona said. He played rugby for Havelock North Junior Rugby Club and also took part in Patu Heretaunga with his father. Joshua Mou's funeral service will be this Saturday, February 2, at Bay City Church on Omahu Rd, Hastings, at 10am. The Eastern District Serious Crash Unit is seeking information about the fatal crash. The crash, involving a van and cyclist, occurred at the intersection of Railway Rd and Southampton St, in Hastings, at 5pm on Monday. Joshua Mou, the cyclist, was critically injured and passed away the next day. Police understand he was travelling east on Southampton St. He then crossed the Railway Rd intersection in to the southbound lane of traffic before colliding with the northbound van. Police are hoping to speak to the occupants of a blue double-cab ute and a blue and grey people-mover-style van that were travelling south on Railway Rd towards the intersection. They urge anyone who has information to contact Senior Constable Tim Rowe on 06 877 0609.